Miller Spectrum® 875 Plasma Cutter with 20 foot XT60 torch has compact size but 60 amps of output power. It features easy operator controls, for optimum cutting and gouging performance. Portable. Cut up to 7/8" mild steel in the shop or at the job site. At 52 pounds, the optional protective cover with cable management pouches allows the user to easily move from location to location. Patented Ultra-Quick Connect torch and work cable offers the fastest plasma torch and work cable connection and removal in the industry. NEW! Ultra-Quick Connect™ XT60 torch with an ergonomic handle to help prevent operator fatigue and a flexible cable that makes maneuvering easier. Heavy-duty work clamp with flexible cable and quick connect. Can be powered by any Miller engine drive with generator power at or above 10 kW (e.g. Bobcat™) or equivalent competitive equipment. Automatic Air Regulation - For customer convenience, the unit has no pressure gauge or manual regulator knob. The unit automatically adjusts the air pressure to the torch for optimum cutting and gouging. No adjustments necessary. Auto-Refire Technology provides ultimate customer convenience by automatically controlling the pilot arc when cutting expanded metal or multiple pieces of metal. The pilot arc will switch in and out as fast as needed when cutting expanded metal and provides maximum power for cutting thicker metal - all automatically! No need for manual re-triggering which reduces user hand fatigue. Auto Postflow calculates the length of postflow time based on the amount of cutting time to optimize consumable life and eliminate excessive air usage. Consumables storage compartment provides convenient access to consumables and parts. LVC line voltage compensation provides peak performance power under variable conditions (187 to 264 volts) for steady and cleaner ending cuts. Wind Tunnel Technology prevents abrasive dust and particles from damaging internal components. Fan-On-Demand cooling system only operates when needed. In dirty or dusty environments, this feature reduces the amount of airborne dust/dirt pulled through the unit. FREE #256033 plasma consumables kit ($160.95 MSRP Value). Plasma Consumables Kit contains genuine Miller® spare parts designed specifically for your Spectrum® 875 plasma cutter with XT60 Torch. Miller Black Slag™ Shade 5 safety glasses feature IR Shade 5 lenses that provide protection for cutting, brazing or soldering applications. Miller White Slag™ Shade 5 safety glasses feature IR Shade 5 lenses that provide protection for cutting, brazing or soldering applications. The Miller® 30" Combo welding jacket, Size S, combines the protection of leather with the light-weight breathability of cloth to create the perfect welding jacket. Genuine Miller® spare parts designed specifically for your Spectrum® 875 plasma cutter with XT60 Torch. Genuine Miller® Plasma Standoff Roller Guide suitable for use with all Miller ICE and new XT30, XT30C, XT40, XT60 plasma torches and Hobart XT12R, XT30R, XT40R plasma torches. Genuine Miller® Plasma Cutting Guide. Suitable for use with all Miller ICE and Miller XT30, XT30C, XT40, XT60 plasma torches; Hobart ICE, XT12R, XT30R and XT40R plasma torches. Fits Miller plasma cutting guide, attaches to all flat surfaces and allows plasma cutting holes up to 30" in diameter. The installation of an Air Filter on the Plasma Cutting system downstream of the air regulator will effectively remove the contamination from the compressed air line. Genuine Miller replacement parts for your Spectrum 875 plasma cutter equipped with an XT60 plasma torch. Does the Spectrum 875 (not the Auto-line version) come with MVP plugs? If not what does it have on it for a plug? No, the Miller Spectrum 875 Plasma Cutter w/20 ft. Torch 907583 can only run off of 208/230V input power so it will not include the Multi Voltage plugs. i have a miller 325 trailblazer what is the thickest it would cut with my trailblazer. Miller Spectrum� 875 Plasma Cutter w/20 Foot XT60 Torch 907583 can cut up to 7/8" mild steel in the shop or at the job site. I am looking for personnel safety requirements for the use of this unit, can you send me an electronic copy? Thanks. 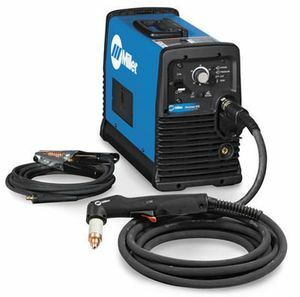 The Miller Spectrum 875 Plasma Cutter w/20 ft. Torch 907583 will require a compressor that can produce at least 6.75 scfm at 90 psi minimum. I have a Bobcat 225, will this machine run off of it. Or what is the largest plasma cutter the Bobcat can handle well? I noticed the rebate on this item. Is the price shown $2279 before rebate? The purchase price for the Miller Spectrum 875 Plasma Cutter 907583 is $2279.00. The rebate is a mail in rebate . Once you purchase the machine you will receive a rebate form.. You must complete the form and send it and a copy of your receipt to Miller.. They will send you a check for the rebate amount . I have a Miller Trailblazer fi 302. What is the largest plasma cutter it will run? what is the input ampere? Does this use the same consumables as the Spectrum 625 with the xt40 torch? Will it run on the miller 300 pro welder/generator? Do I need to get an air filter and moisture removal filter for this machine or does the internal filter do it all? can i cut 18ga. with no warping. Cutting 18 gauge material with the Miller Spectrum 875 Plasma Cutter 907390011 will require that you dial the ouput of the machine all the way down ..Approx 20 amps.. Then your torch travel speed will have to be fast enough to prevent warping while still getting a clean cut..To develop this technique will require a little practice ..
How many years warranty does the machine come with? Can I upgrade this unit to use a machine-held torch later? No ..The Miller Spectrum 875 Plasma Cutter 907390011 will not accept a machine torch . If you want to purchase a model that could be upgraded to a machine torch you will need a Miller Spectrum 875 Plasma Cutter with Auto Line.. The plasma torch that comes with the Miller Spectrum 875 Plasma Cutter 907390011 has a one year warranty.. There is no figure on exactly how long a torch will last..If it is well maintained and properly use it may last for years..
Works perfect the first thing I cut was 1" flat bar with no problem. The unit is so light you can take it anywhere, so save some money and stay with the 20 ft torch. The machine is awesome. Had a hiccup with the first machine they sent but Cyberweld was able to jump thru hoops and get us a machine asap. Primary user was older son and he was on leave so we timed the first arrival 2 days after he got in from Qatar but unfortunately we had a faulty machine. We had dealt with Miller tech support 2 plus times( involved redoing air lines from a 18 scfm compressor) and still didn't get the cutter working so I called Cyberweld and spoke with Bonnie at customer service and 2 days later we had a new machine that works great. Cyberweld went the extra mile for us. Very rare in this day and age. Kudos. Love the machine, good price, and fast delivery, Thanks. I just purchased the NEMA adapter and fired it up this afternoon for the first time. Like a hot knife through butter, on a 11 gauge, square tubing test material; it is rated to cut cleanly to 7/8". ProsPowerful, intuitive, compact, easy to grasp/learn the concept and cannot wait to draw with it! This plasma works as well as expected. High quality! not used it a great deal yet but cuts great. The 875 is at least 4 times the machine I was using. My old plasma cutter did great for 14 years, then it started to get tired. With this one, it's like a turbo charged plasma, more air, more amps, thicker material, and much much faster. The Miller consumables are easy to use, readily available, and less expensive. The filter is nice to have a little whip on the end, so it flexes a little. What a great machine. I would buy again, but this one will last me a while. The product arrived on-time, and has worked flawlessly. What was really appreciated is the attention to online security when ordering. There was an issue with our billing address, and CyberWeld WOULD NOT process the order until this was verified and corrected. We will definitely purchase from these guys again! Cutter works great will do everything advertised. Seller CYBERWORLD would not take care of missing parts or give answer to simple questions....Would buy the machine again but never from CYBERWORLD! Works great I run it off of a miller trailblazer. I use it to cut old rusted steel to new steel never a problem. This was my first Miller plasma cutter purchase. Previously I was sold on Thermal Dynamics. Miller doesn't use the consumables nearly as fast. The Miller consumables are also cheaper. As far as cutting, this machine will breeze through anything you throw at it and not back up. Best plasma cutter I have ever used. Small easy to use. Very well built. After having a few weeks to work with this plasma cutter I could not be happier. I have used it to cut as thin as 1/8" mild steel to 1-1/8" ornamental iron to 1" spring steel. The performance was exactly as advertized. I'm a hobby welder so this cutter gets used about twice a week. Before obtaining this cutter, I used cutting torches for all my projects and cutting thinner stuff neatly was not one of my specialties. Now I can "write my name" in 1/8" with ease and precision. For an enthusiast such as my self, this has been an excellent plasma cutter. It works flawlessly and cuts though a wide variety of materials without a glitch. I mainly use it for cutting through sheet and plate, and with just a little practice it makes very nice clean cuts that require only al ittle prep afer the cut.